February was not the kindest month to the state of Georgia. First there was the disastrous response to an apocalyptic winter storm (folks further north might better recognize such an event as “Tuesday”), which left thousands without electricity for the better part of a week. And because the earth clearly hates peaches, it hit Georgia with a 4.1 magnitude earthquake on Saturday. One who believes in a grand design might ask just what Georgia has done to earn all of the bad juju that has been seemingly heaped on it. One who believes in a grand design and common sense might reply that it could have something to do with Confederate Flag Georgia license plates. Confederate Flag Georgia license plates, for whatever reason, are not a new thing. The new design simply ramps up the presence of the battle flag—now featuring it prominently in the background in addition to a badge beside the plate numbers—when compared to the outgoing design. So not only are Confederate Flag Georgia license plates a thing that have existed for some time now, they are apparently also a thing that someone determined was not overtly ridiculous enough. Now with Confederate Flag Georgia license plates, you get twice as much suggested racism for your buck! Sounds like a great deal, right? Yeah, we can have that discussion. Right now, if you’d like! I’ll go first: if you proudly display the Confederate Battle Flag, you are implicitly advocating our racist history. Call it Southern pride, call it cultural awareness, call it respect for our forefathers. Whatever. If you’re not using the word racism in there somewhere, you’re doing it wrong. It’s one thing to acknowledge that something happened—after all, learning from our past mistakes is the only way to prevent repeating them—but it’s another thing entirely to turn a symbol that is predominantly associated with oppressing an entire race of people into an accessory. And that’s what the Confederate Flag Georgia license plates are doing, whether you’d like to admit it or not. It’s taking something that once flew over battlefields where men fought and died for the right to own slaves and turning it into fashion. Trust me, I see it plenty here in Ohio, which perturbs me to no end. You’ll see more than enough pickup trucks whizzing by with Rebel Flag decals stuck to the windows, and if you’re super unfortunate, you may even see someone flying the flag from their vehicle for all to see. Granted, a lot of these people may not be stupid or inherently racist as much as they are abundantly uninformed. They see the flag as another facet of “redneck” culture. Those people would be wrong, but you almost can’t blame them for simply wanting to digest whatever certain people feed them without doing a little of the think-work for themselves. Except, you probably should blame people for not thinking. If people thought more, we wouldn’t have ridiculous garbage like 9/11 Memorial Wine and Confederate Flag Georgia license plates. It’s particularly appalling that the state of Georgia will no doubt turn a profit off of the plates’ $80 price tag. Oh, but it’s okay because they’ll be giving ten dollars to Sons of Confederate Veterans, someone who is an idiot will no doubt chime in. No, it’s not excusable because you’ll be funding what is essentially a historical reenactment troupe. It’s not even excusable if you’re using proceeds to fund actual veterans of the actual wars we are actually fighting right now. Uh, you guys do remember that the Civil War was largely fought because Northern states were pushing for the abolition of slavery, yes? And that Southern states seceded because they didn’t want to lose the industry of slavery and give slaves their rights? Guys? Sure, we can talk about states rights (e.g. the rights of southern states to maintain a slave-driven economy) and tension between the government and the people (brought about largely because of a difference of opinion regarding slavery) as being motivating factors, but the straw that broke the proverbial back of the south’s camel was the fact that the Northern states had moved away from an agricultural economy in favor of an industrial one and no longer needed slavery. The South needed slaves, and they were not going to give them up without a lot of bloodshed. Now, we don’t need to get into a history lesson here because there are people far more qualified to discuss the atmosphere leading up to/during/following the Civil War than I, but I think you get the point. If not, I’ll spell it out: the Confederate Army fought to keep African-Americans in chains, and thusly, their flag is a symbol of oppression. Clear enough? Good, because that simple idea should be enough to affirm why profiteering from Confederate Flag Georgia license plates is a terrible idea. But why not? To commemorate Black History Month, why not have states produce limited edition plates that feature significant moments relative to the Civil Rights and Black Power movements? Sure, we can disregard the more violent aspects of the latter and focus on the inspirational and heartening moments of history. Then each state can donate proceeds to an organization that supports black youth. Everybody wins, right? What, you mean you think that people would be against that for some reason? I wonder why. And I wonder how many of those people are the kinds of folks who would happily slap Confederate Flag Georgia license plates on their cars. 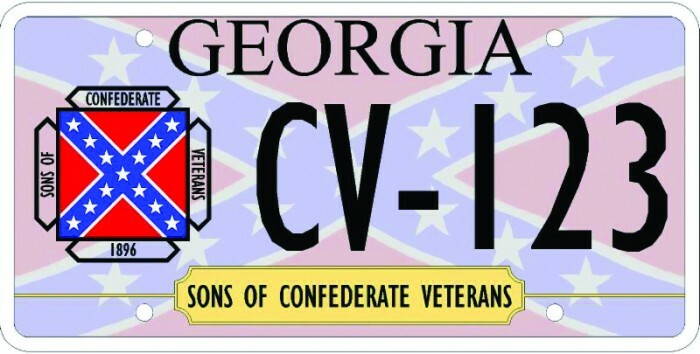 According to Ray McBerry, spokesman for the Georgia Division of the Sons of Confederate Veterans, the plate is not meant to offend anyone in particular, but is simply a means through which Southerners can commemorate their heritage. Further, he added that the state would be discriminating against the Sons of Confederate Veterans by not allowing them to offer the license place. “Membership in the Sons of Confederate Veterans is open to all male descendants of any veteran who served honorably in the Confederate armed forces”. Funny that you are so worried about being discriminated against that you don’t even notice your own proclivities for discrimination. 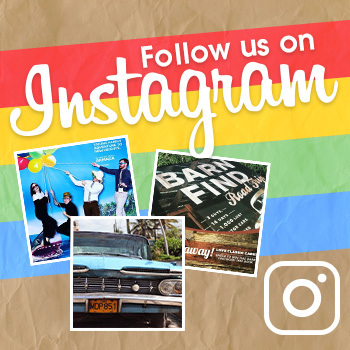 Here’s an idea: what if LGBT groups in Georgia pushed to have their own license plate that displays the Rainblow Flag and donated the proceeds to teenage outreach groups? Do you think the He-Man Woman Haters Confederate Club would be among the first to stand up and advocate for their rights? Well, why don’t we have a look-see at this Gawker article about South Carolina Rep. Garry Smith cutting the budget of two universities for having the temerity to assign Alison Bechdel’s Fun Home and Out Loud: The Best of Rainbow Radio to students. Now I know it’s not Georgia, but provided that a South Carolina native made some vague attempt to scold me for being intolerant in their defense of the Confederate Flag, I figure this is pretty pertinent information. I suspect we might be able to form a speculative answer to the question I posed yesterday from information like this: not only will groups and individuals in power not advocate for the rights of other groups and individuals when they conflict with their personal beliefs, but they may even do whatever they can to punish anyone who even so much as suggests that a certain way of life is acceptable and equal. Do I even need to mention the fact that the same Confederate Flag flies proudly over the same State House that approved this ridiculous bill? Didn’t think so.